Henry VII | Wendy J. Dunn, Award-Winning Author. “This truly, this is he unto whom both we and adversaries must yield and give over the dominion (Williams, p. 21) so uttered Henry VI on his first meeting with his young nephew Henry Tudor. But Henry’s birth came with no loud fanfares, nor lighting of fires, heralding the birth of an English prince. Rather, on Saint Agnes Day, in 1457, Henry was born to a thirteen-year-old girl, recently widowed of her husband Edmund Tudor, at the Welsh castle of her baby’s uncle, the capable, and very loyal to his own, Jasper Tudor. Taller than the average Welsh man, very little in Henry’s early years predicted his greater destiny lay as the first king of a new dynasty. Very little except a very determined mother, who placed all her hopes in him, and the backing of his father’s family. But, after years of uncertainty and exile, Henry Tudor became King of England, gaining the crown in one of the most ancient ways imaginable: battling it out with the man who already sat on England’s throne and taking up the crown after that man’s bloody death. He consolidated his victory by marrying the person who really had greater right to the crown than him – Elizabeth of York, a twenty-year-old girl, niece to one, newly slain, York King, and daughter to another. Her father’s early death through illness – when his two sons were both only children – had opened the door wider to further savage struggles for the crown. It would be interesting to know what Elizabeth of York felt about marriage to her Lancastrian cousin. Considering that she came of a line of strong women and grew-up at Court watching her mother’s example that never shied from welding power behind the throne, Elizabeth is a surprisingly meek English Queen. But I am always suspicious of ‘meek’ women, and have sometimes wondered if this ‘face’ she represented to the world hid what in fact was her true power. I think it possible that Elizabeth may have had enough of the bloodshed marring her early years, and decided to do all that she could to provide a proper ‘helpmeet’ for her husband – so peace could have a chance to take root again in English soil. If this indeed was her magnate, Elizabeth was very successful in achieving it. By the time of her death, in childbirth at thirty-eight, the kingdom was well on its way leaving ‘The Wars of the Roses’ where it belonged: in the realm of English history. Of course, Henry himself had a lot to do with his country’s greater stability. Religious, superstitious, with an enjoyment of pageantry and music; a creator of symbols – it was Henry who invented the Tudor double rose (Morris, p. 56). While not the complete miser painted by some history books, Henry VII was nevertheless a cautious man who well deserved Bacon’s later praise of “a wonder for wise men” (Morris, p. 56). 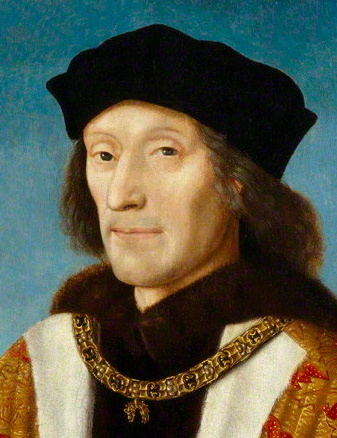 Henry VII – not a weak King by any means- didn’t hesitate to scythe down his rivals, even with little cause. But Henry’s great intellect and instinct for survival steered a course that ensured his dynasty kept hold of England’s crown.